Youtube user "Keysosaurus" created the hack with C#, XNA and OpenNI coding, as part of his coursework at Trinity College in Dublin, Ireland. 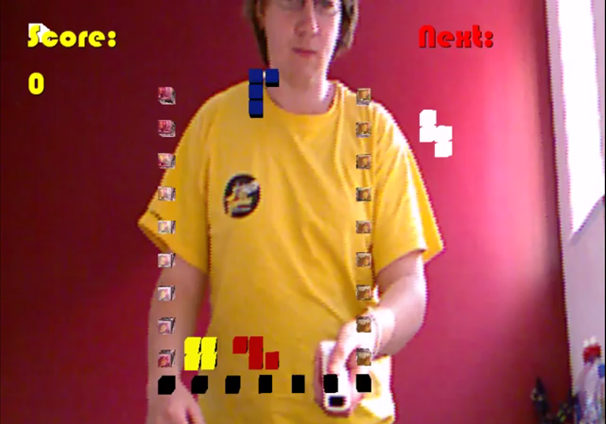 It works by taking the real world around the player's head, tracked by the Mircosoft Kinect, and placing the Tetris platform over the top. You can move the overall playing field by simply moving your head. The Wiimote comes in to rotate the pieces as you wish to stack them, while you can use your hands to move the pieces around the grid. The hack also shows your score, and which piece will be coming up next. Elizabeth Fish avoids Tetris for fear of getting addicted... again.